I welcome you to our page and hope that you find your hearts desire, we are two lovely ladies that only wish to bring you the most arousing content, so please set back relax and enjoy, we are here to please. It will be a Pleasure to hear from you~! This prude little town of Irvington needs a little more excitement and Madam Lace knows just what to do. When Rosalind ran away from her broken home she hoped to find a place where she could be at peace. She never expected to become a prisoner anywhere else. 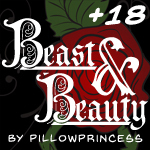 Our NSFW re-imagining of the Beauty and the Beast fairy-tale.